April 17 is Giovanni Battista Riccioli’s birthday. 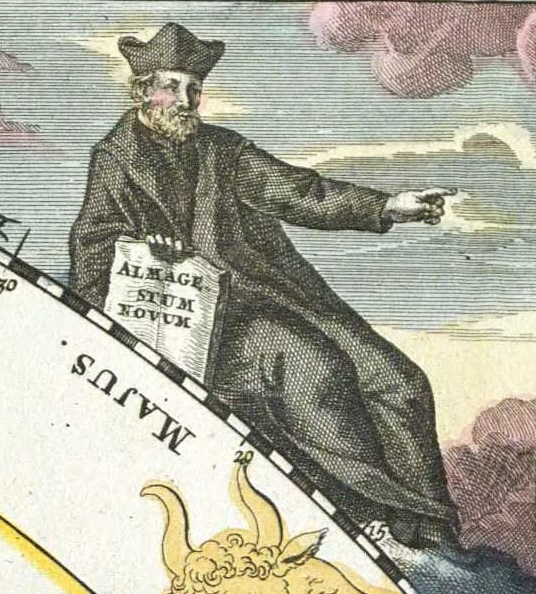 Riccioli was an Italian astronomer and Jesuit priest who is best known for naming the features of the Moon. In 1651, he published Almagestum Novum which became a standard text for any serious astronomer well into the 19th Century. It was a collection of over 1500 folio pages of text, illustrations, and tables covering every known subject relating to astronomy. Subjects like the celestial spheres and the movement of the planets, the size and distance of the Sun, the known comets and novae, and discussions dealing with both heliocentric and geocentric theories of the structure of the universe. The section of this book dealing with the Earth contained the first accurate measurements of the acceleration due to gravity. He performed several experiments using pendulums as timekeeping devices. He showed a pendulum’s period with a small amplitude was constant to a tolerance of two swings per 3212 swings (within .07%). Using a pendulum with a period of one second, he found there were 86,400 seconds in a day. He verified Galileo’s observation where the distance a falling object covers is proportional to the square of the time of the fall. When we look at the Moon’s surface, we see large light and dark areas and circular craters. Riccioli labeled his lunar map with romantic names for these features. The smooth dark areas were named with emotions and referenced large bodies of water such as Mare Serenitatis (Sea of Serenity) and Mare Tranquillitatus (Sea of Tranquility). The craters had names of famous astronomers and scientists like Tycho, Copernicus, and Archimedes. The names of the Moon’s seas are still used and craters are still named after famous figures in science. One section of his book dealt solely with arguments for and against heliocentricism. Copernicus had published his model in 1543 and created a stir in academic and religious circles. The prevailing belief was based on the Earth being firmly rooted in place and the rest of the universe revolves around us. Copernicus moved the focus from us to the Sun. Riccioli outlined a total of 126 arguments for or against this theory based on scientific knowledge of the time. Some of the arguments against are similar to the arguments used today in favor of the Flat Earth. How could buildings stand up if the planet whirls around the Sun? Why don’t we feel the Earth moving? Why don’t flying birds get left behind as the Earth moves below it? This section of his almanac has many scholars wondering if Riccioli was a closet Copernican. Jesuit priests could hardly be expected to publically support Copernicus’ theory. The slant of the arguments tended towards support of this theory even though he never said his opinion one way or another. 1994 – Roger Wolcott Sperry died. Sperry was an American neurobiologist who was awarded half the 1981 Nobel Prize in Medicine for discovering the function of the different sides of the brain. He found the left lobe of the brain is responsible for analytical and verbal tasks, where the right was responsible for spacial and artistic tasks. 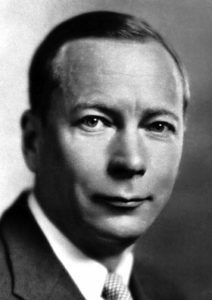 1976 – Carl Peter Henrik Dam died. Dam was a Danish biochemist who discovered vitamin K. Dam was working with chickens to determine if cholesterol is a necessary part of their diet. He fed them chicken feed with all fat removed. The chickens fell ill and began to hemorrhage internally. When Dam fed the chickens pure cholesterol, their symptoms cleared up. Something in the cholesterol helped the chicken’s blood to coagulate but did not match up with any of the other known vitamins. He called his new coagulation nutrient Koagulations-Vitamin or vitamin K.
Dam would earn half the 1943 Nobel Prize in Medicine for this discovery. Edward Doisy would win the other half of the prize for isolating and synthesized two versions of Vitamin K and determining their structures. 1946 – Georges J.F. Köhler was born. Köhler was a German biochemist who shared the 1984 Nobel Prize in Medicine with Niels Jerne and César Milstein for the discovery of the production method to create monoclonal antibodies. Together with Milstein, he developed the hybridoma technique to produce monoclonal antibodies. They fused antibody producing B-lymphocyte cells with tumor cells to produce a hybridoma that continuously produced antibodies. This technique is used in the commercial development of diagnostic tests and new drugs. 1942 – Jean Baptiste Perrin died. Perrin was a French physicist who discovered cathode rays were actually made up of corpuscular negative charges (electrons). He is best known for verifying Einstein’s theories of Brownian motion and calculating Avogadro’s number, the number of molecules per mole of a gas. 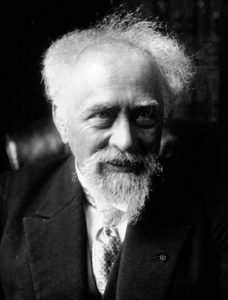 His work in determining the equilibrium constant of suspended solutions would earn him the 1926 Nobel Prize in Physics. 1598 – Giovanni Battista Riccioli was born.